I think I’ve said in the past that fall is my favorite time of year. The clothes are better, the weather is better, and the food is – well – different. To say that I don’t love food and cooking all year round would be misleading. I just love the richness of flavors and textures and colors in the fall and winter. Do you think things taste better in your favorite turtleneck sweater or when consumed by a fire? While with a friend (tony clark, photographer extrordinaire) a few weeks ago, we stopped in a wonderful little gourmet shop here in Atlanta called Savor. We had a wonderful time talking with the owners and browsing through all of the goodies in the store. As I was standing around the register, I saw a recipe card for a "roasted acorn squash with a cranberry horseradish sauce". This particular recipe was promoting this company’s prepared sauce. However, it planted a seed in my head. – Preheat oven to 350.Cut acorn squash in half and bake in a pan (i do mine flesh side down) filled with a 1/4 inch of water in the bottom until fork tender – this should take somewhere around an hour. – While the squash is baking, mix up your cranberry sauce. Since I made this up, you can just wing it like I did. I took prepared cranberry chutney (i think you could use any kind of cranberry sauce..except for that weird jellied kind) and added the zest of 1/2 an orange, salt, pepper, and a tablespoon of prepared horseradish. I kept mine cold because I thought it would be a good foil for the warm tender squash. 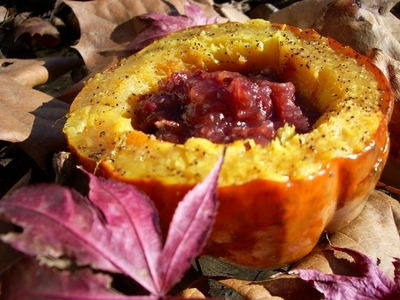 I think would also be nice if you cut the acorn squash in crescents and roasted it & topped it with the sauce warmed up. – When the squash is done, salt and pepper each half. Then, fill halves with cranberry sauce and pig out! Oh, the humanity I have been replaced. Now that you have a digital camera and a little knowledge you’re not going to need me anymore. I particulary like the leaves, nice touch.